Also, we need to replace the lifelines with the correct gauge of wire, 4mm for a boat of 12m, and replace the quick release shackles with pelican clips, again for Cat 1 compliance. 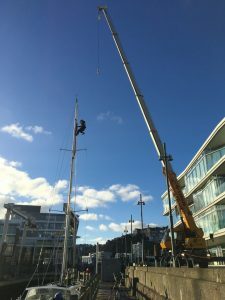 Lifting the mast out when it’s 15m tall requires a decent size crane. Unfortunately when the mast was lifted the riggers had to cut the wires to free them from the mast base. This was partly because all the wires passed through a 25mm pipe in the mast step that was filled with Sikaflex. Removing the mast base to clean it up was quite difficult. it couldn’t be lifted more than about 2cm off the deck, so I had to spend about an hour digging out Sikaflex with a sail needle. Once the mast base was off we took it home to paint it. A later step was to have the reefing lines, vang, outhaul, topping lift and main halyard led back to the cockpit, which meant 10 blocks which needed to be attached to padeyes through the deck. We decided that the less holes the better, so instead went for a base plate under the mast step to hold the blocks. A stainless steel mast plate fabricated to site under the step. Inside the boat the wiring was very difficult to trace, there were no easily accessible panels in the headliner, so I decided to remove small parts of it to gain access and route the wires up to the mast. 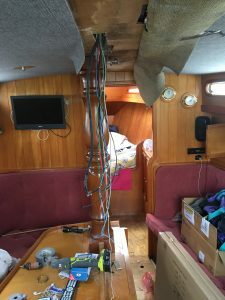 In the picture above you’ll see a cable gland on the bottom left, this was part of a decision to have the wiring come out from the side of the mast, down a conduit into the deck. 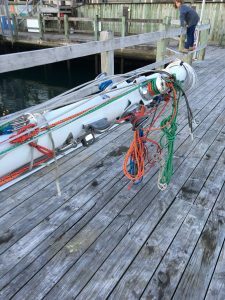 The reason for this was twofold, avoiding the nightmare of removing the mast step for the next person to take the mast out and to avoid any water ingress from inside the mast into the cabin top. 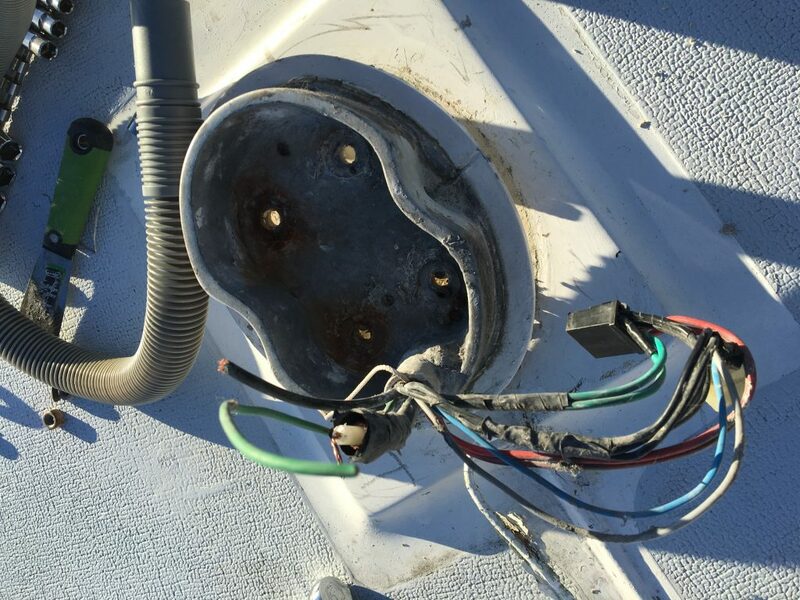 Dog Star is a super dry boat, but the one spot I did find some water damage was in the headliner underneath the wiring from the mast. 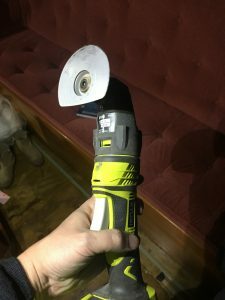 A very useful tool for slowly removing the headliner. 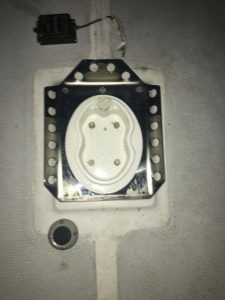 The new wiring will be much easier for the next owner to service, by removing a small panel in the headliner, access to the joins in the wiring will be possible, meaning that they won’t need to cut wires when removing the mast.